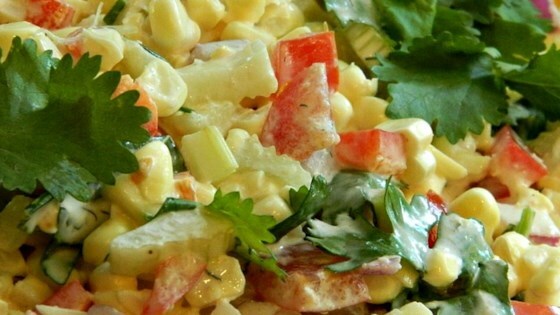 "A quick and tasty salad which makes a great addition to any cookout." Mix corn, tomato, bell pepper, celery, red onion, and garlic in a bowl. Pour ranch dressing over the corn mixture; stir. Fold all but 1 tablespoon cilantro into the corn mixture. Sprinkle reserved cilantro over the salad to serve. This recipe was absolutely delicious!!! I didn't add the celery because I don't like it, but it was still great. Everyone enjoyed it and can't wait for me to make more. We liked it. Something a little different for a side. Very nice and easy fresh side salad. I used a combination of fresh parsley, thyme, and basil (we don't like cilantro) plus a bit of garlic salt and pepper to ramp up the ranch flavor. It was delicious! As previously mentioned though, it did need salt and pepper but other than that, it was perfect.